Sweet name, huh? I do think so myself! I made this decadent treat for my 23rd birthday in March. I received a springform pan as a birthday gift and knew immediately that I needed to use it right away. I wasn't in the cheesecake mood, but I did know that I was craving chocolate (but let's be honest...when am I not?!). 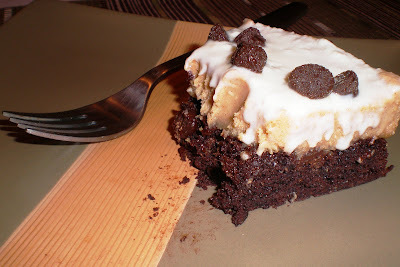 While looking through my "starred" recipes in Google Reader, I came across this one for Peanut Butter & Cream Brownie Torte. YUM. Very simple to prepare - the brownie part is actually from a boxed mix. But don't think less of me...let me explain. I wanted a great birthday treat, but since I would be making it myself, I wanted it to be easy. So think what you want (but I'm begging you not to judge me!). 1-12 ounce container frozen whipped topping, thawed and divided - I used the kind from a can because Trader Joe's does not sell Cool Whip - didn't have the same effect, but still good! Heat oven to temperature listed on your boxed mix. Spray an 8 or 9-inch round springform pan with no-stick cooking spray. Prepare brownie mix as directed on box. Pour into springform pan and bake in the oven. The time will depend on your mix - 35-45 minutes is common. Be sure to check the middle with a toothpick. If it comes out clean, it's done! Cool while in pan. Beat cream cheese with an electric mixer on medium speed until fluffy. Gradually beat in peanut butter, powdered sugar and 3 cups whipped topping until well combined. Keeping dessert in springform pan, spread mixture evenly over cooled brownies. Top with remaining whipped topping. Use the tines of a fork to create swirls in the whipped cream. Sprinkle chocolate chips on top - if desired. Refrigerate 2 hours before serving. Remove side of pan just before serving.